Tree identification hike participants were greeted with unexpectedly pleasant December weather — upper 40s, bluebird skies and no snow! 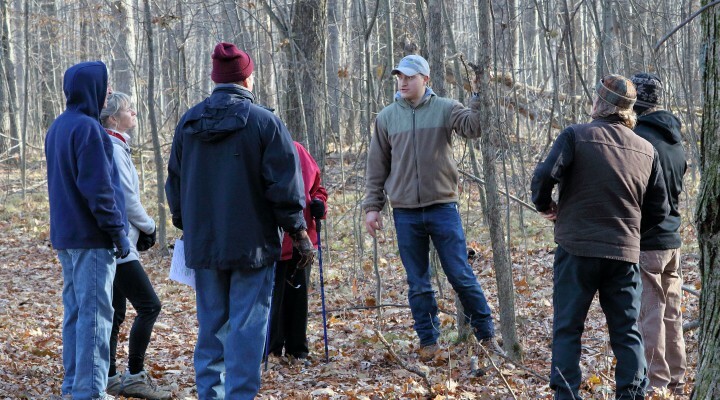 Hikers learned about the differences between coniferous and deciduous trees, invasive species and how historical logging practices influence ecology and natural resource management today. Former Conservancy executive director, Stan Lilley, even made an appearance and offered an interesting perspective on how the forest stands at Sylvan Solace Preserve have evolved over time. Mark your calendars for our next environmental education hikes on January 1st, 2018 at Sylvan Solace and Bundy Hill Preserves.